Artist, Gill Robinson has always had a passion for music and in early 2007 she set out on a series of works exploring performance. Below she explains the inspiration behind her ‘Theme and Variations’ project. 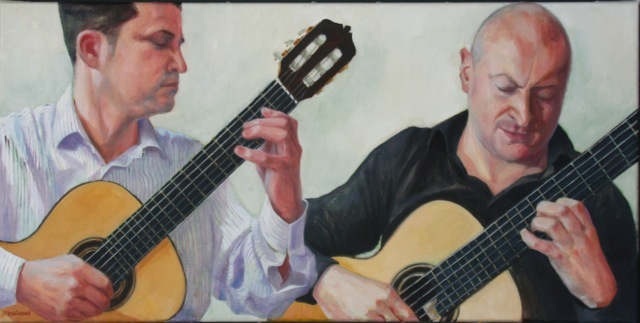 I began working with Mark Eden and Christopher Stell in January 2007 on a project to make a series of drawings of them playing during rehearsal. I wanted to explore the idea of musical performance visually, trying to capture and convey something of the powerful intensity and dynamic interaction of their work. 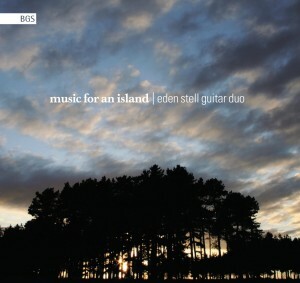 The Eden Stell Guitar Duo take a new direction with the release of their multimedia CD ‘MUSIC FOR AN ISLAND’ on the BGS label. The Duo’s passion for performance innovation has resulted in a finely crafted and syncronised multimedia concert of music and images inspired by landscapes and locations from around the UK. The diverse programme covers the length and breadth of the British Isles from the Orkney Isles to the seaside promenade of Eastbourne, taking in the Holy Island of Lindisfarne, leafy Sherwood Forest, May Hill, and the Beatles’ Liverpool along the way. Welcome to our new-look Eden Stell website with up-to-date info and news on our concerts, recordings and other events. 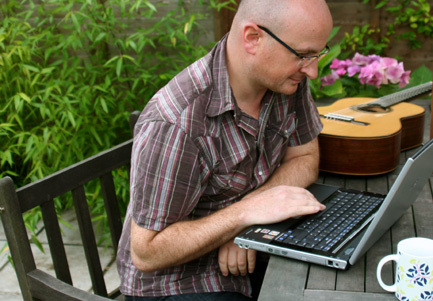 We hope this new site will be constantly evolving with frequently added news items and posts covering a host of topics such as forthcoming Eden Stell CD releases, our projects, concert dates and features on guitar related topics such as technique, practice tips etc.